One night last fall, a motorist hit a black bear that had wandered onto a road on the north shore of California’s Lake Tahoe, leaving the disoriented cub in the middle of the highway. Someone else came across the young bear and called the sheriff’s department, which blocked the road. Then the authorities contacted Ann Bryant, the executive director of Bear League, an organization that rescues bears. The cub was reunited with his mother the next morning, but oddly enough, the mother bear herself was hit by a car two weeks later and is now recovering. Accidents like these have become all too common as California’s drought extends into its fourth year, forcing a growing number of the state’s 25,000 black bears to come down from the mountains in search of food and water. Wildfires like September’s devastating King fire in Northern California destroyed thousands of acres of bear habitat, further depriving the animals of food. Bryant estimates that about 300 bears have been killed over the last few months—many more than usual. After wandering down from the backwoods, bears have no clue what to do when a car approaches. Bryant’s rescue group now gets half a dozen phone calls daily from people who run across bears—in their backyard, on the road, and elsewhere. Front-lawn fountains, koi ponds, and backyard garbage cans have become sources of water and food for foraging bears. Bears spend close to 20 hours a day hunting for and eating food in the fall to bulk up for the winter, and Bryant said the animals can smell food from miles away. 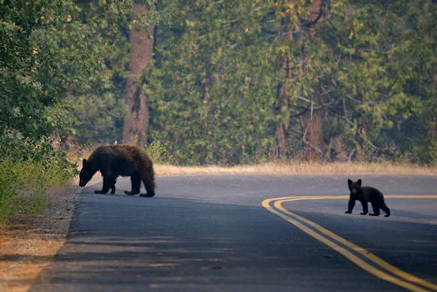 The California Department of Fish and Wildlife, however, is hesitant to blame the drought or food scarcity for the increase in bear and deer roadkill. Department spokesman Andrew Hughan and wildlife biologist Jason Holley said the drought and wildfires are among many contributing factors to wildlife deaths. Hughan said the department has not noted a dramatic rise in animals being killed but acknowledged that it does not keep detailed records of road-related deaths. Bryant said she has no doubt the drought is to blame for a spike in bear deaths. One controversial solution her group supports is diversionary supplemental feeding, which involves dropping food for bears via helicopter or bikes so the animals do not leave their habitat. That flies in the face of conventional wisdom, which suggests that people should not feed bears, as it disrupts their natural instincts. There is one thing you can do: Slow down and brake for bears.